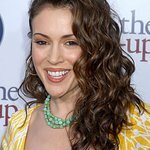 Alyssa Milano is giving up her birthday for the children of Flint. The star – whose birthday is December 19 – is asking for donations to help kids affected by the water crisis. Donations have already rocketed over her target of $20,000 – but she’s not stopping! “I’m giving up my birthday for the children of Flint, Michigan,” says Alyssa. "Will you help me make sure they receive toys this holiday season? “The Flint water crisis is not over even though the federal water assistance they were receiving has stopped. “And 60% of children in Flint live below the poverty line.